Good morning from Hamburg and welcome to our last FX Report this week. Today, we will report about the USD and European economic data. Also we analyze the EUR. We wish you a nice weekend. The USD dropped versus the EUR this morning after the European report published that Europe’s gross domestic product expended for the first time in six quarters. The EZ GDP climbed to 0.4 from -0.2% after the USD continued its trend and weakened against the EUR to 1.4865 after it climbed over 100 pips on Thursday. Also the JPY rose against the USD and trades around 89.80, currently. The AUD expanded its gains versus the USD and reached 0.9253 after a report showed that employer’s offers more jobs in October. This let suspect that the Reserve Bank of Australia will raise its interest rate for the third time in a row. The AUD/USD climbed to 0.9288 after it climbed to a high of 0.9370. It was the highest level since August 2008. In the Euro-Zone are speculations that the gross domestic product in the 16-nation EUR region rose 0.5% in the third quarter from the second. Since May 2009, the European Central Bank has kept its benchmark interest rate at 1% and is lending banks unlimited cash for up to a year to help Europe against the recession. Jean-Claude Trichet signaled that the December offer of 12 month loans to banks will be the last. With the beginning of November, the EUR recovered from its bearish movement and has been trading in a bullish trend against the USD. Recently, the currency pair fell to its Fibonacci Retracement level at 1.4841 (50%). Two times before November, the prices recovered at this level, which makes this level to an important support. 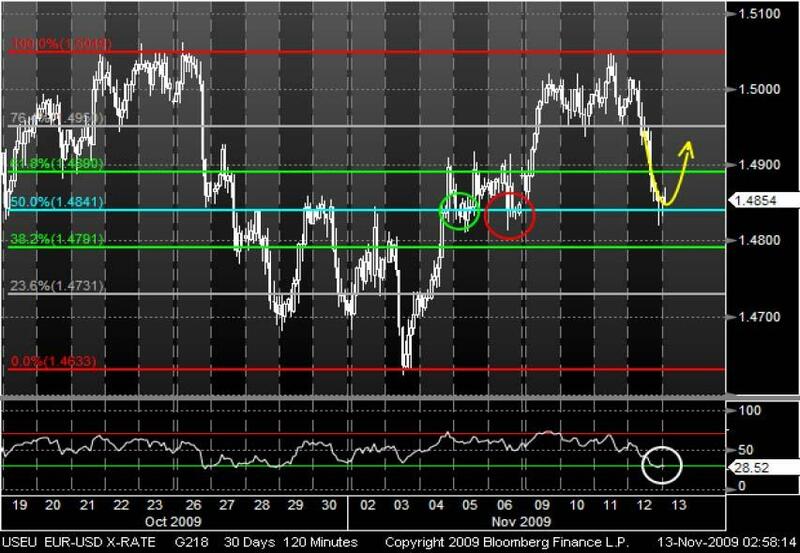 Also the RSI may indicate a pull back for the EUR, but it remains to be seen if the support at 1.4841 is strong enough. 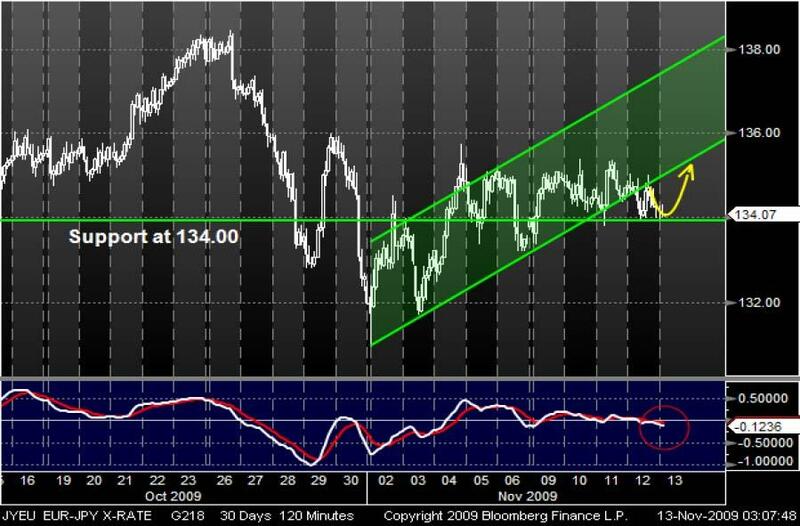 Since the beginning of November, the EUR has been trading in a bullish trend channel versus the JPY. Yesterday, the currency pair has left its trend channel and crossed the bottom line. Now, the EUR trades at its support around 134.00 and maybe the support is strong enough. Furthermore, maybe the MACD will cross the signal line from below in the next days, which might support a repeatedly trend reversal.